The Easter Rising was a rebellion carried out by separatist republican groups demanding Irish independence in April 1916, in the midst of the First World War. Most of the fighting took place in Dublin, where the insurgents seized a number of buildings. The British authorities, fearing the prospect of German involvement in the rebellion, bombarded central Dublin and the rebellion was crushed after six days. Much of Dublin's central commercial districts were destroyed by a combination of artillery, and fires caused by both the British bombardment and looters. These images form a record of the devastation in the immediate aftermath of the rebellion. The aftermath of the 1916 Easter Rising had significant implications on the future of the country, and it is now remembered as a seminal event to the formation of the Irish Free State. These images reveal how Ireland remembered the Rising in the 1950s and 1960s. In particular, images from the 50th anniversary commemorations in 1966 offer a revealing insight into how the country reflected on the Rising half a century later. Political figures such as Sean Le Mass and Eamon De Valera feature throughout the collection, as well as members of the public who were a part of the fighting. They are pictured with their former garrison in significant locations such as Kilmainham, Earlsfort Terrace, and Liberty Hall. 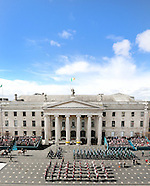 To commemorate the 1916 Easter Rising, hundreds of thousands of people flocked to Dublin city centre and various other locations around the country. Events ranged from the somber to the celebratory as the nation paused to remember those who fought, and died, in the Rising. Photographers from the Irish Independent were in the thick of the action, poised and ready to capture the Easter centenary as it unfolded.